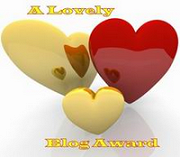 I received this very pretty award from Susie a few weeks ago. Susie is a mine of information about blogging and I've learned a lot from her blog 1st Floor Flat. Thank you Susie for the award - I'm honoured. I must apologise for the quality of these photos. I'm not sure what happened but I think I need a new camera. Either that or the anti-shake isn't working. Sorry. I want to give you a quick look at one of my everyday books that I use to write down my ideas and add snapshots of books I make. I made this case bound book when I was doing my book binding training at Sydney TAFE in the 90s and it is holding up very well to many years of use. Cloth covered, it has commercially made headbands (how dreadful that seems to me now) and I've trimmed out pages in every section to make room for all the bits and pieces I've pasted in. At one stage early on it looked as though it was going to explode so I took to it with a scalpel which seemed drastic at the time but saved the integrity of the book in the long run. 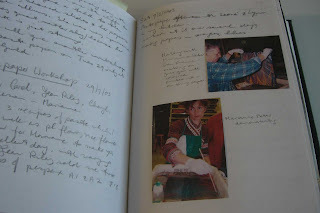 Above are journals I've made to write family history and to document some of my history of natural history information. 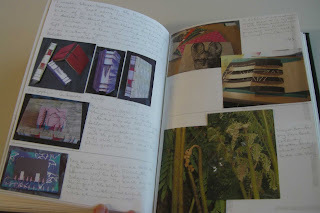 This is a rather poor photo of the book that made me realise that I wanted to make artist's books. 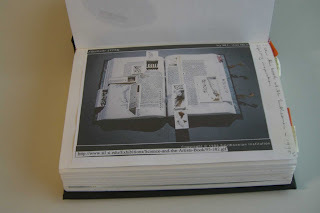 I was researching in the Rare Books Library at the Dibner Library of the History of Science and Technology, Smithsonian Institution Libraries, I think in 1996 and I was lucky enough to be given a special viewing of the exhibition Science and the Artist's Book. Do look here to get a better look at this book [M.L. Van Nice Plinitude Somerville, Massachusetts, 1994 [seeds, bones, insect wings, feathers, wood, leather, paper, acrylic]] and the others in the exhibition. It wouldn't be an exaggeration to say that this book and the entire exhibition changed the direction of my work, and in many ways, my life. Above some coptic/celtic/icicle bindings that I've talked about elsewhere. On the left are some cross structure bindings and on the right my Jenny Hanniver : the unauthorised biography - a book I will be completely overhauling soon because I can't live with the faults. More bits and pieces including a star book based on Thirteen Ways of Looking at a Blackbird. Above are many different book structures, most of them purely for fun. I make books for the challenge and commercially, but the greatest joy for me is making a book just for fun. This book is actually titled (in silver) Marbling Muses, a bit of a hopeful title really, especially as I have difficulty capturing any kind of muse lately, let alone the one dealing with marbling. So here are photos from Marianne Peter's brilliant oil marbling workshop with a few notes visible from her paste paper workshop. I've just noticed that in the book I've said Marianne comes from France. Wrong - she comes from Belgium! 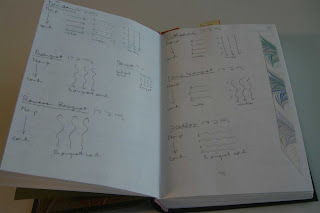 With great enthusiasm I've sketched pages of marbling guides to favourite designs. Of course when I actually marble I completely forget to follow the instructions and I get very excited if my paper turns out the way I intended. I also enjoy the surprise of the unexpected. This is the head of the book, showing some of my marbling, which I like, the "made" headband, which I don't like, and the stubs of the pages I've sliced out. I think on the 'post-it' is a recipe for guar gum base for the marbling I did with Marianne Peter. So - not an amazingly beautiful book but one I would be most unhappy to lose. 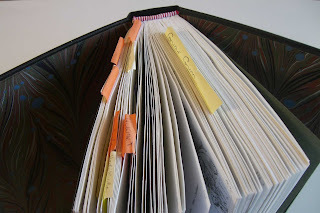 It not only has years of plans, ideas, recipes, instructions, photos, drawings - it is chock full of great memories of people and books and the wonderful fellowship with other people who love to bind and marble. Like the people I'm meeting through blogging. thank you for sharing that! It is so great that you have been fastidious about documenting your work. What a wonderful journey. Thanks Rhonda, I try to keep a record of my work but there are things that don't go in it, like the commercial work. Not because I deliberately leave it out but I never think of it at the time. I suppose it is a different part of my book binding life. Maybe I should start a book just to document that. It's great to have your blog showing up in my reader again! And what a prodigious note-taker! Ah, Carol. You have the discipline I wish I had about documentation. Thank you for the wonderful pix. 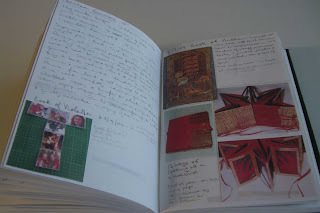 I also always love learning about what it was that inspired a bookmaker to make books. Thank you for the photo as well. What a wonderful post. 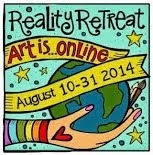 You've shared an inspiring window into your work (and life)and I am in awe of your experience and achievements. Thank-you for this, and also for the link to the smithsonian. Your books are treasures in themselves. I wish I had taken the time to record things like that. wow, so beautiful! I love books with a passion and what an art you've made it! wonderful! 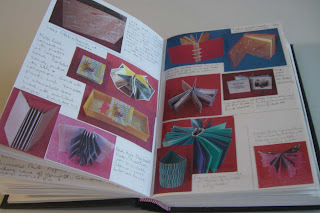 Your journals are wonderful and a great insight into your bookmaking. How I'd love the opportunity to turn the pages of this book! There is a danger your fascinating posts could get me interested in book making, Carol and there's just not enough hours in the day. Hopefully I can continue to enjoy yours. I love to read your comments and I do reply to each. I've turned off word verification and comment moderation for the moment but will see how that goes. 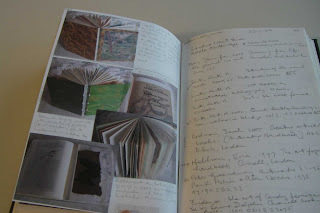 As a book binder trained in Sydney and Auckland, I am currently interested in drawing, print making, and all aspects of the artist’s book. My lifelong passions have always revolved around books, both making and reading, and natural history. 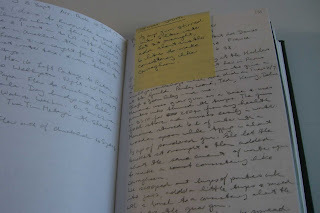 From 1980 until retirement in 2004 (and later on contract)I worked in the Research Library of the Australian Museum and was privileged to work with the Rare Book Collection. My interest in the marine animals depicted in the 16th and 17th century natural history books has led to a series of hand made books I am working on, featuring my re-drawings of these animals. Wamberal, on the beautiful NSW Central Coast, is where I live and work, in easy reach of 7 beaches and lagoons. What has been Up, you Ask? Recycling Bushell's Tea Bag Box. 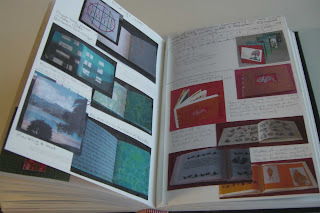 Association of Book Crafts (New Zealand) Inc.